Yellow sac and hobo spiders are both venomous spiders which often enter homes throughout the US. "Venomous spiders" is an alarming phrase, but bites occurring from these spiders typically do not lead to serious health problems. With that said, however, if you have been bitten by a spider or even suspect you may have been bitten, always seek the advice of a doctor to diagnose the bite and learn ways to prevent an infection. Yellow sac spiders are found only in the Eastern US in most New England and Midwest states such as Rhode Island, Ohio and Massachusetts. Hobo spiders are only found in the Pacific Northwest in Washington, Idaho and Oregon. Yellow sac spiders are unique in that they do not build webs. Instead, they create small silk-like sacs that they stay in during the day. They also produce tiny egg sacs which can be seen in corners, behind furniture, on ceilings and in basements. Yellow sac spiders live outdoors for most of the year but wander into homes as the temperatures drop in the fall. They are about 1/4 inch long and pale yellow-green in color. Like most spiders, yellow sacs come out in the dark and feed on other insects. They will only bite as a defense mechanism when they feel threatened, which tends to happen as a result of simple contact with humans (for example, if you put on a shoe that has a spider inside). These nocturnal spiders occasionally make their way into most areas of the home, and and may even crawl onto people. seal around all plumbing pipes throughout the home. 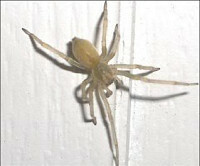 Hobo spiders are larger than yellow sac spiders and have a long leg span of about an inch and a half. They build flat funnel-shaped webs in crevices throughout residential structures. Webs are most commonly seen in holes and cracks in basements, crawlspaces, garages and even in outdoor vegetation. Hobo spiders will only bite upon accidental contact with humans as a defense mechanism. In case you are bitten, as with all bites from venomous spiders, seek immediate medical attention. It is also important to try to catch the spider that bit you, as it will help in identification and determining the proper treatment. remove bed skirts, covers, and any other linens that might touch the floor and enable spiders to crawl onto the bed. Move beds away from walls and curtains, keep clothing off the floor and store shoes in boxes with tight-fitting lids. If you have anything more than a minor hobo spider problem, ask for advice from a professional exterminator to find the best way to exterminate. What Kind of Pesticide is Your Exterminator Using?